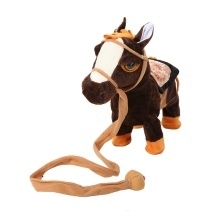 Cute electric walking horse plush toy, 100% Brand new and good quality. Powered by 3*AA batteries(not included), very easy to use. It can walk and sing, which will attract your kids&apos; attention easily, so interesting. A great toy for your children. Cute electric walking horse plush toy, 100% Brand new and good quality. Made of soft plush and filling pp cotton, safe and non-toxic, comfortable hand feeling. Powered by 3*AA batteries(not included), it can walk and sing, very interesting. A great toy for your kids, and your kids will be so happy to play with it and walk with it around the house. Note: The battery is not included.